Sustainability, going green, eco-friendly are all popular terms we use and see every day, but what are industries doing to address these challenges? Kraus-Anderson has taken a unique approach to living its environmental stewardship, creating a home for Urban Honey Bees. 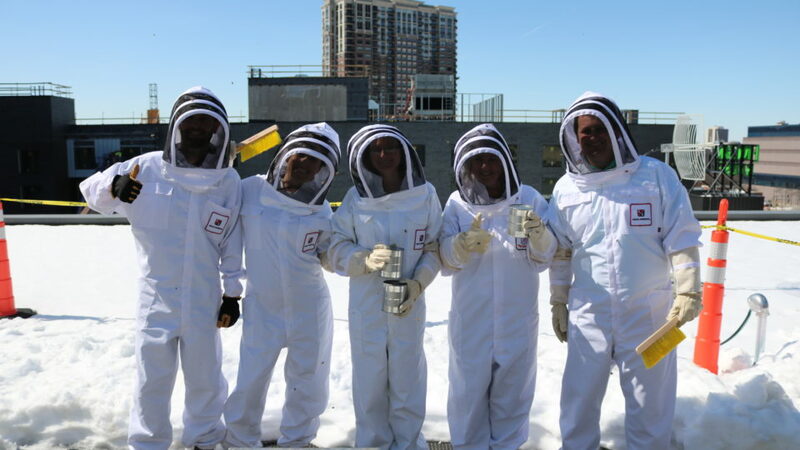 KA’s “Buzz Squad” brought the adopted bees home to the roof of our headquarters building in downtown Minneapolis in April, and they’ve been thriving ever since. Here’s the buzz from Buzz Squad Chair Brenden Ward. What kind(s) of honey bees are living on the KA rooftop? Why was this species selected? BRENDAN WARD, PROJECT COORDINATOR & KA BUZZ SQUAD CHAIR: Kraus-Anderson’s urban honey bees are the Carniolan species. They are a very mellow and gentle bee; less prone to becoming irritated and stinging. They are also a heartier bee. They can survive cold winters and have little brood disease. We also chose this kind because they don’t have much of a robbing instinct, which means they won’t steal from other hives in the area. Bee colonies consist of drones, workers, and a queen. Remind us of what each one does. How many colonies will reside on the KA roof? How many bees does that represent? WARD: Drone: Single sole function is to mate with the queen (note: these are often confused with queens because of their size being much bigger than workers). Workers: These bees do most of the work, hence their name. They split the work up into outside the hive and inside the hive tasks. Inside they are cleaning cells, capping cells of brood, caring for brood, tending and feeding the queen, receiving nectar from foragers, making honey, removing the trash, packing pollen, building comb, ventilating the hive, guard duty, temperature regulation. Outside the hive they take orientation flights which helps them to familiarize themselves with landmarks surrounding the hive (food and water) and void feces. They also will leave the hive on foraging flights to gather nectar, honeydew, pollen, propolis, and water. We have 3 colonies on the roof with 3 queens. Each colony is about 7,000-10,000 bees. So, I would say we have roughly 25,000-30,000 bees on our roof. Once fully matured our bee population could grow to 100,000. You’re using a couple of different types of hives. Talk about that. Langstroth Hive is the most common design of hives, the Langstroth hive uses frames. These frames are often filled with some form of foundation to give the bees a proper starting position and template for building comb. These frames are then installed in hive bodies. The Langstroth hive is known to impose artificial segregation of the colony by physically dividing honey from brood by use of the brood chambers, for brood development and bee residence, and the honey supers, for excess honey collection. Top-bar hives are a more natural type of hive because the bees have to build their own comb from scratch. A top-bar hive is a single-story frameless beehive in which the comb hangs from removable bars. The bars form a continuous roof over the comb, whereas the frames in most current hives allow space for bees to move up or down between boxes. Where do these bees come from? How will be the bees be transported and introduced to their new hives? to get to know each other. We purchased our bees from a local company in Stillwater, MN called Nature’s Nectar. They have been a great resource and offer great advice when it comes to caring for the bees. How was the queen be released/acquainted to the hive? WARD: The queen came in its own cage (see photo on the right). We hung her cage inside the hive so that the bees and her could get acquainted with one another. Where will the bees get their food? How far will they travel for food? WARD: We will feed the bees a sugar syrup solution and pollen patties until about mid-June when the flowers begin to bloom. 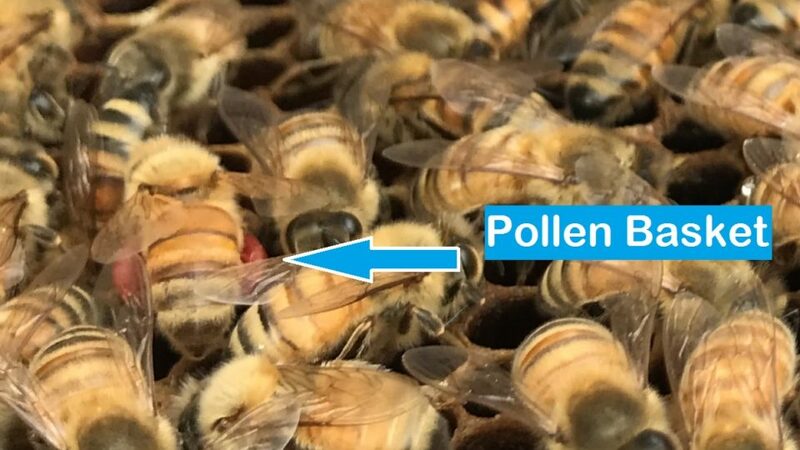 However, we have been seeing a lot of the worker bees leaving the hive and coming back will pockets full of pollen (see photo below). Honey bees will typically fly between 2-3 miles to forage for food. What happens to the bees over the winter? Will the Buzz Squad have special duties to help the bees survive in the cold months? 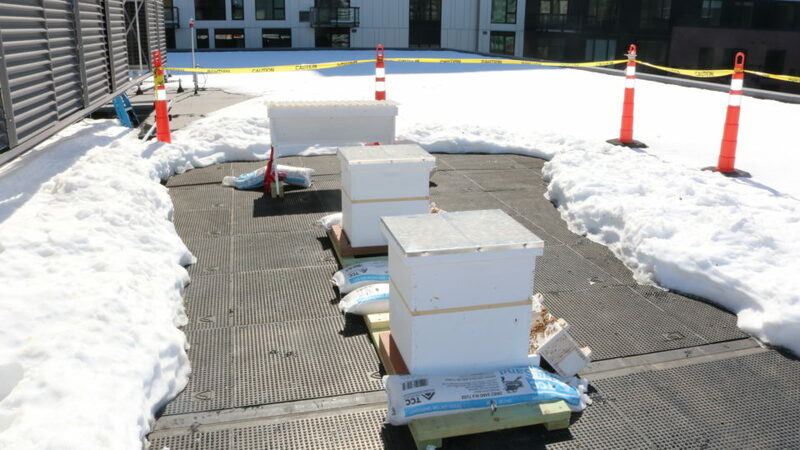 WARD: We will winterize our bees, which includes wrapping the hives with insulation, using the planter boxes as wind breaks, and making sure they have enough honey stores to survive. Pretty much we will do everything we can to give them the tools they need to survive with some inspections once a month over the winter. Great information for those of us, especially me, that had no clue about the bees and their hives! Thanks for the article.